Paris-Sud University (French: Université Paris-Sud), also known as University of Paris — XI, is a French university distributed among several campuses in the southern suburbs of Paris including Orsay, Cachan, Châtenay-Malabry, Sceaux and Kremlin-Bicêtre campuses. 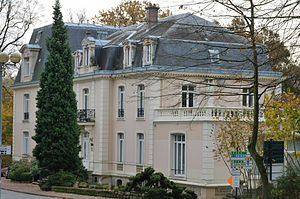 The main campus is located in Orsay (48°42′00″N 2°10′24″E﻿ / ﻿48.699890°N 2.173309°E﻿ / 48.699890; 2.173309). This university is a member of the UniverSud Paris and a constituent university of the federal University of Paris-Saclay. Paris-Sud is one of the largest and most renowned French universities, particularly in science and mathematics. Four Fields Medalists and two Nobel Prize Winners have been affiliated to the university. The current president of the University is Sylvie Retailleau. Paris-Sud was originally part of the University of Paris, which was subsequently split into several universities. After World War II, the rapid growth of nuclear physics and chemistry meant that research needed more and more powerful accelerators, which required large areas. The Université de Paris, the École Normale Supérieure and the Collège de France looked for space in the south of Paris near Orsay. Later some of the teaching activity of the Faculty of Sciences in Paris was transferred to Orsay. The rapid increase of students led to the independence of the Orsay Center on March 1, 1965. Now it hosts a great number of laboratories on its large (236 ha) campus. Many of the top French laboratories are among them especially in particle physics, nuclear physics, astrophysics, atomic physics and molecular physics, condensed matter physics, theoretical physics, electronics, and nanoscience and nanotechnology. University of Paris-Sud comprises some 104 research units. About 30,000 students are currently enrolled. Pierre-Gilles de Gennes and Albert Fert, two Nobel Prize winners of physics, were affiliated to the University of Paris-Sud. A number of most renowned French mathematicians are or were affiliated to the University of Paris-Sud as well. Among them are the Fields medalists Laurent Lafforgue, Jean-Christophe Yoccoz, Wendelin Werner and Ngô Bảo Châu. Paris-Sud also comprises biology and chemistry laboratories, engineering and technology schools and has established partnerships with many of the surrounding technology centres and Grandes Ecoles. It also includes Schools of Law, Economics and Management. In October 2015, The University of Paris Sud has been ranked 10th best university worldwide in the Times Higher Education Under 50 which is ranking of the world top 100 universities under 50 years old. Paris-Sud is ranked 2nd in France, 10th in Europe and 41st worldwide by the 2017 Academic Ranking of World Universities (ARWU). (5th in Mathematics, 12th in Physics worldwide). QS Ranking has ranked the University 241th in the world, 95th in Natural Science, 173th in Medicine and 305th in Engineering. Wikimedia Commons has media related to University of Paris-Sud. ^ "Prizes and notable researchers - Université Paris-Sud". www.u-psud.fr. Retrieved 2015-12-15. ^ Laboratoire de l’Accélérateur Linéaire. Lal.in2p3.fr. Retrieved on 2014-06-16. ^ Institut de Physique Nucléaire d'Orsay. Ipnweb.in2p3.fr. Retrieved on 2014-06-16. ^ Laboratoire Aimé Cotton - UPR 3321. Lac.u-psud.fr. Retrieved on 2014-06-16. ^ [Laboratoire de Physique Théorique d’Orsay]. Th.u-psud.fr. Retrieved on 2014-06-16. ^ University of Paris Sud (Paris 11) in World Top 500 Universities. Shanghairanking.com. Retrieved on 2014-06-16. ^ "Université Paris-Sud Rankings". Top Universities. Retrieved 2015-12-15.